Superior Felt & Filtration defines success through a proven philosophy of being customer driven and providing quality products at competitive prices. Superior is dedicated to continued growth with focus on new technology and expanding product lines. We pride ourselves on providing an excellent work culture for our valued employees and doing the best job possible in every facet of our business. 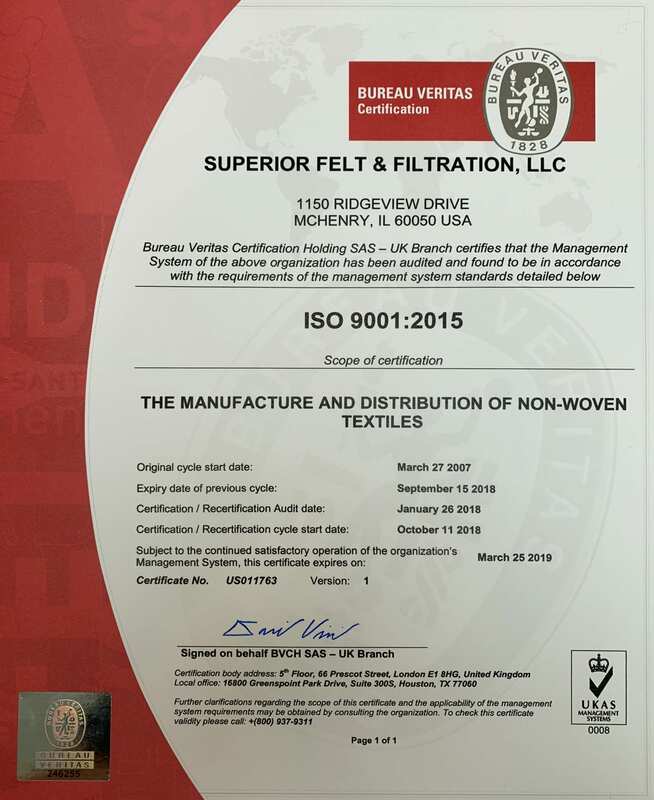 As an ISO 9001 company our goal is to service our customers the best way possible while improving our quality and capabilities, thus creating a foundation of success for the future. For more information on our markets served and products or to request a quote, contact our Customer Service department who are here to help. Fill in your information below and a member of the Customer Service team will get back to you as soon as possible. Or if you prefer, you may call us toll free at 1-800-255-3358.